These spectacular pieces are of supreme importance, for their historical connections, their superb quality and their rarity. Marked 1711-12, they were made by Elie Pacot, a leading French goldsmith for John Churchill, 1st Duke of Marlborough, one of Britain's greatest military leaders. They would have been displayed on a sideboard in the dining rooms at Blenheim Palace and Marlborough House, alongside other gold and silver vessels, as evidence of the duke’s wealth, patronage and status. 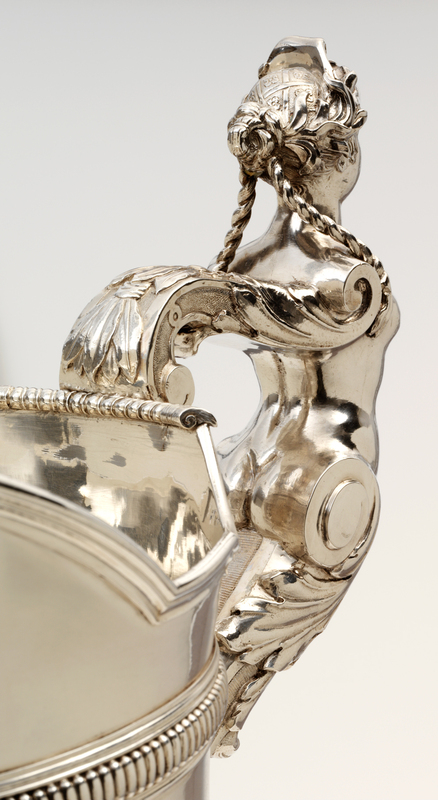 The ewer and basin show the very high standard of French cast silver. This was due to a strict guild system in France. A prospective silversmith had to serve an eight-year apprenticeship and then to submit a trial work, or ‘masterpiece’, as proof of his skill before qualifying as a master. In England, by contrast, the system was less rigorous and many silversmiths did not even belong to the guild. French silver of this period is very rare as most was melted down in 1689 and again in 1709 to finance Louis XIV's war effort. There was a further melting of silver in the reign of Louis XV in 1759. The Pacot ewer and basin have survived because they were made for an important British patron and remained in a British private collection after his death. 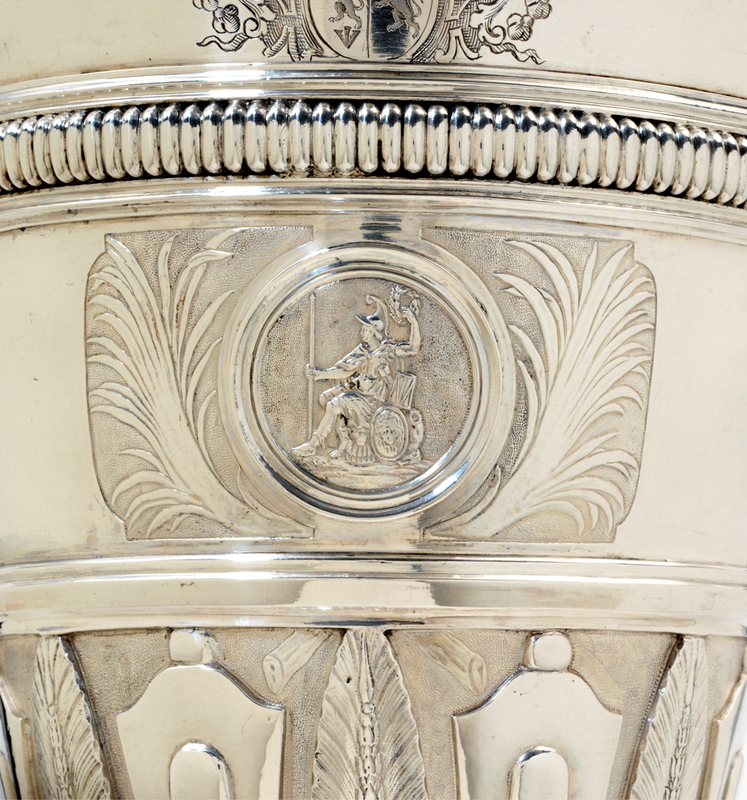 They are a rare example of a British patron commissioning French silver from outside Paris. Until the basin and ewer entered the collection in 2007, the V&A had no French silver of equivalent date or prestige from the pre-Revolutionary period. There were some fine small domestic pieces, including a Lille-made coffee pot of 1778, but nothing on this scale. 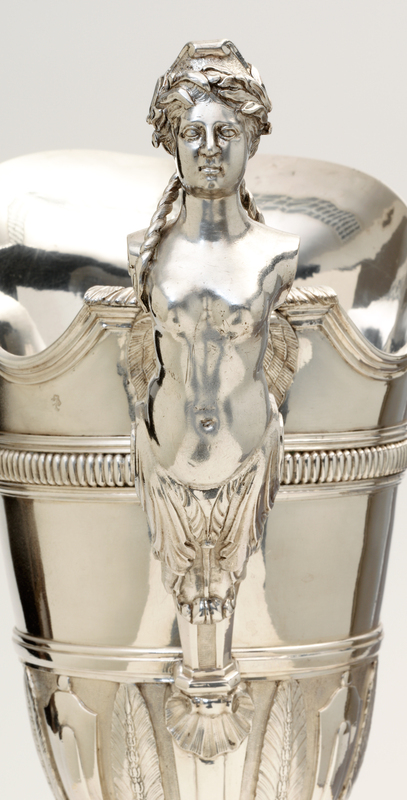 This makes the ewer and basin two of the most significant objects in the entire run of silver galleries, an appropriate match for the Castlereagh Inkstand at the other end of the display. In the words of his descendant Sir Winston Churchill, the Duke of Marlborough ‘never fought a battle that he did not win, and never besieged a place that he did not take’. Born of an impoverished gentry family, John Churchill enjoyed a meteoric career as a soldier and statesman, and a close, though troubled, relationship with Queen Anne. Much of this was due to the intelligence and determination of his wife Sarah, who for over twenty years was the queen’s confidante and close friend. His heroism was legendary and his portrait, along with his companion at arms Prince Eugène of Savoy, appeared on contemporary gaming pieces and playing cards.With success came great wealth and many titles. John Churchill was made Earl of Marlborough in 1689 and Ist Duke of Marlborough in 1702. Two years later, after the victory at Blenheim, he was made a Prince of the Holy Roman Empire by Emperor Leopold, and shortly afterwards a Prince of Mindelheim in Swabia by Leopold's successor Emperor Joseph. The highpoint of Marlborough’s career was the War of Spanish Succession of 1701-13, in which Britain and the Dutch Republic attempted to check French expansion. He distinguished himself in the field of battle as no English general had done before him, serving as Captain-General and then Commander-in-chief of the Allied armies. Among his many victories was the taking of Lille in 1708. Marlborough's role was to cover the siege with a field army to prevent the French relieving the city, while Prince Eugène attacked the citadel. After a 120-day siege, and over 20,000 casualties, the citadel finally surrendered on 9 December. In the tapestry woven for Marlborough celebrating the Siege of Lille the town is shown in the distance with Marlborough standing in discussion in the foreground. The victory at Lille was followed by others at Tournai, Malplaquet and Mons. At home, however, Marlborough’s position was less secure. The queen was tiring of the increasingly bossy duchess and political rivals had begun to undermine the duke’s authority. The duchess left the court in January 1711 and in November of the same year Jonathan Swift published his Conduct of the Allies which claimed that the whole war had been a plot by Marlborough and his foreign friends to enrich themselves at the expense of the Treasury. On 30 December 1711 the queen dismissed the duke from all his offices. Marlborough then went into exile on the Continent, spending some months at Aix-la-Chapelle near Lille. With the accession of George I in 1714, he resumed his position of Captain General of the Allied Armies but was never again seriously consulted or trusted. In 1722 he died, leaving Sarah to survive him for another 22 years. It was originally thought that the ewer and basin were presented to the Duke of Marlborough by the city of Lille to ensure his protection. However, recent searches in the Lille archives have found no evidence for this. In the notebooks kept by Marlborough's French secretary Adam Cardonnel, the only gifts recorded are tulip bulbs presented by the Netherlands and a horse presented by the King of Prussia. Instead, it seems that Marlborough commissioned the ewer and basin himself. The maker, Elie Pacot, was a leading goldsmith in Lille and undertook work for the allies, including the future George I. He supplied at least six pairs of candlesticks to British customers, including one pair to the Duke of Marlborough, and may also have made a 19-piece table centrepiece for the duke. Pacot was born in 1657 to a Bordeaux merchant family. He is first recorded in Lille in 1688, when he married and registered as a master, with a workshop in the Place de Lion d'Or. This bookplate indicates his status as a leading goldsmith in the city. It displays Pacot’s coat of arms and shows Elijah in the Fiery Chariot and Elisha dressed appropriately in a goldsmith's smock. Tiron was the son of Jean Tiron, master founder at the Paris Mint, and specialist mould maker to the Paris goldsmiths. He had been apprenticed to Philippe Rougemaille in Paris in 1701, married Pacot’s daughter in 1707 and worked in his father-in-law’s workshop from the same year. He only became a master in Lille through the patronage of 'Prince Eugène et autres Puissances' – according to a rival who probably could not pronounce or spell Marlborough's name and referred to him thus. Marlborough was clearly a patron of Tiron and Pacot, and in 1712 he may have intervened with the town magistrate over a dispute about Tiron’s professional status. The sculptural quality of the ornament, particularly the female term handle and laurel-crowned male mask on the ewer, reflect Tiron's contribution to Pacot's workshop. The elaborate engraved cartouche on the basin, traditionally attributed to Blaise Gentot, has recently been reattributed to Nicolas Garlette, recorded as an heraldic engraver in Lille from 1700 to 1728. The helmet shape of the ewer is typical of French silver of this period, as is the sculptural decoration. The border of the dish is enriched with shells, foliage and classical medallions in the style of Louis XIV’s court designer Jean Berain. 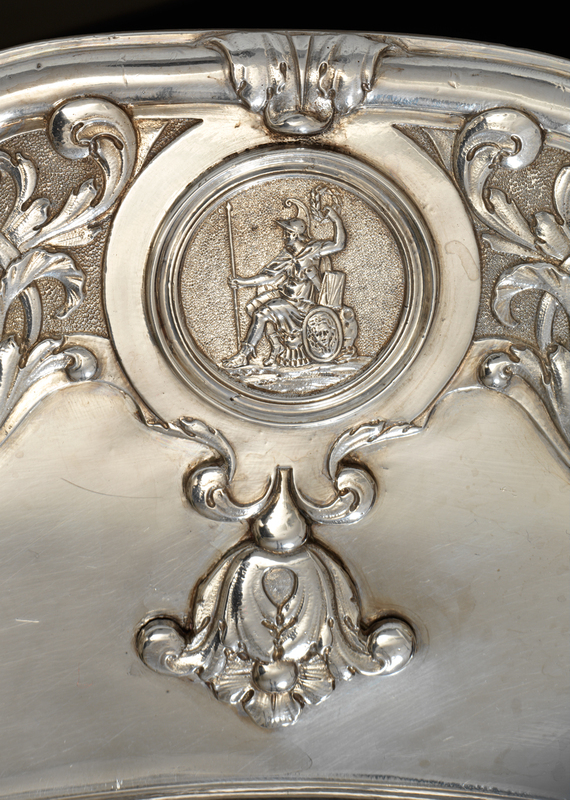 But Pacot may also have designed his pieces to complement existing display silver in the duke’s collection, specifically a pair of silver basins supplied by the Royal Jewel House as part of the official silver for Marlborough's 1701 appointment as ambassador to The Hague. These basins were made in London in 1701 by the Huguenot refugee goldsmith Pierre Harache. In Pacot’s work Minerva, goddess of wisdom, the practical arts and warfare, features prominently. On the ewer she appears in a medallic ornament on the body, as a war goddess with her spear and Medusa-head shield. On the rim of the basin she appears in a similar medallic ornament, but this time as patroness of the arts with Pegasus on her helmet, along with the heads of Roman emperors and empresses. Other features of the decoration are also clearly devised for a British military hero. The trophy of arms in the centre of the basin includes weapons, drums and trumpets, their banners bearing Queen Anne's royal monogram AR for ‘Anna Regina’. Like other grandees of the time, the Marlboroughs were enthusiastic patrons and used the arts as a public expression of their great wealth and political power. Their most important project was Blenheim Palace, Oxfordshire, which was built to designs by Sir John Vanbrugh and largely funded by Queen Anne in recognition of Marlborough's military achievements. In London they built a mansion near St James’s Palace to designs by Sir Christopher Wren. Both were furnished and decorated in a style worthy of a duke. At Blenheim the duke’s military victories are portrayed in an extensive series of murals painted by Sir James Thornhill (who also decorated the dome in St Paul’s Cathedral) and Louis Laguerre, and by a magnificent set of tapestries commissioned from a leading Brussels weaver, Judicos de Vos. Silver would have formed an important part of the display. As well as the silver he used at home and during his military campaigns, the duke also acquired silver for official entertaining during his period as ambassador in 1701 and for his court appointment as Groom of the Stole in 1704. 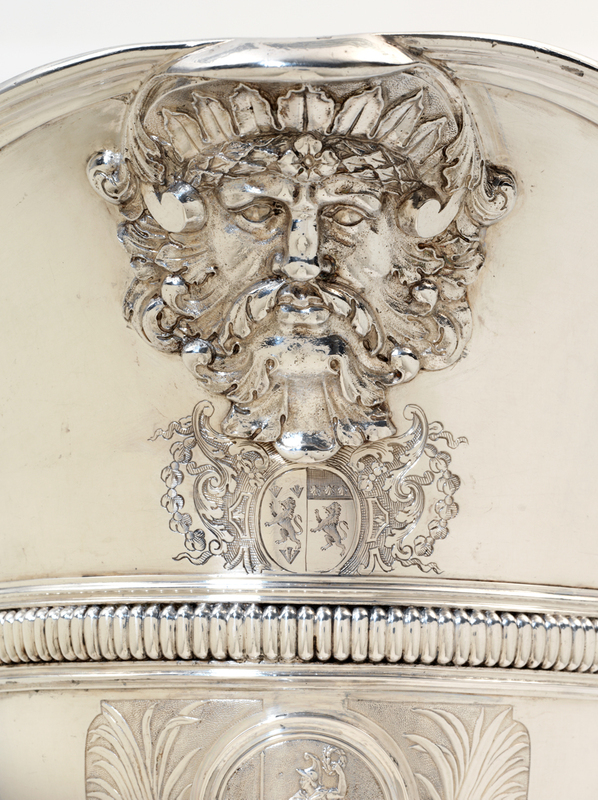 Like the buildings and their furnishings, the silver used by Marlborough is of exceptional quality and unusually well documented. 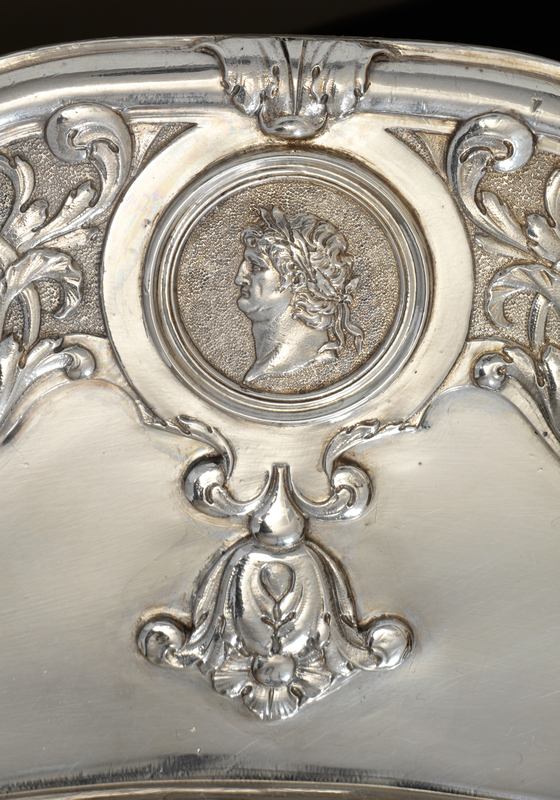 Certain pieces from his collection suggest that the duke had a taste for French silver. He commissioned work from French Huguenot goldsmiths working in London and also owned items made in France. When the duke died in 1722 his silver passed to his widow, Sarah. 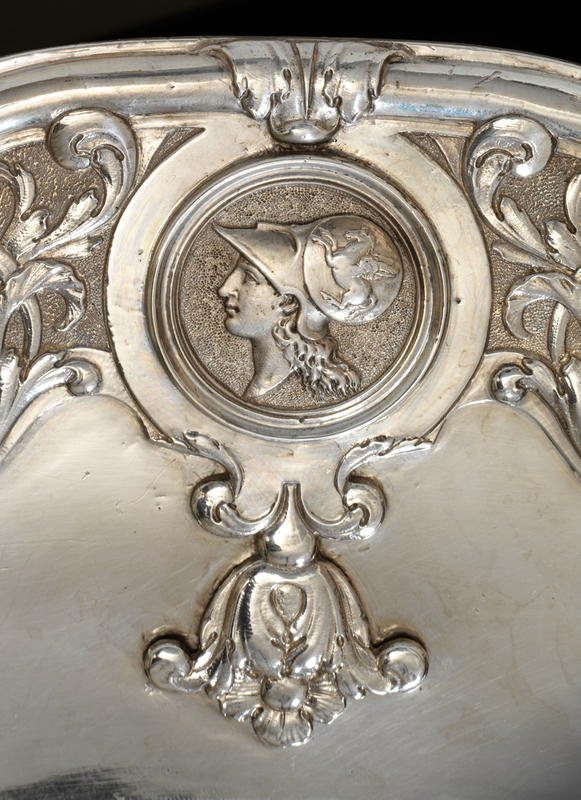 The ewer and basin were still in her possession in 1733-5, when a codicil to her will described the basin as 'a dish for the buffet with the ducal arms, in French silver'. The basin with its ewer probably passed on Sarah's death in 1744 to Scroop Egerton, 1st Duke of Bridgewater (1681-1745), whose first wife had been Marlborough's favourite daughter, Elizabeth. The Duke of Bridgwater’s second wife was Rachel Russell, daughter of the 2nd Duke of Bedford, and he replaced Marlborough ducal arms in the centre of the basin with his own, impaled with those of Russell. The Marlborough arms are still just visible on the basin, but more evident beneath the lip of the ewer, where the legs of the lion rampant of the fourth quarter of Marlborough's arms are visible below the later Russell lion rampant. Accepted by HM Government in Lieu of Tax and allocated to the Victoria and Albert Museum, 2006. Acquired by private treaty sale through Christie's with grants from The Art Fund, The National Heritage Memorial Fund, Old Possum's Practical Trust, The Broadley Trust in memory of Roy Tiley, The Charlotte Bonham-Carter Charitable Trust, the American Friends of the V&A through the generosity of the Paul and Elisa Cahn Foundation and The Audrey Love Charitable Foundation and donations from Simon and Cathlyn Davidson, an anonymous donor on behalf of Lola and Gigi Griffith and further contributions from individuals including the Silver Society and V&A Membership.